So I achieved my goal of release version 1.0 of Indigenous in the iOS App Store before the end of June! The catch? It didn't have all the features I wanted to get in and it still has some random weird bugs I need to work through. But I set a pre-order date in the App Store and just kept working and creating new versions and uploading them. The current version that the App Store release yesterday (June 30th) was v1.0.1, but v1.0.2 is currently in review and should be released in the next couple of days. So what has changed between 0.3 and 1.0.2? A lot. 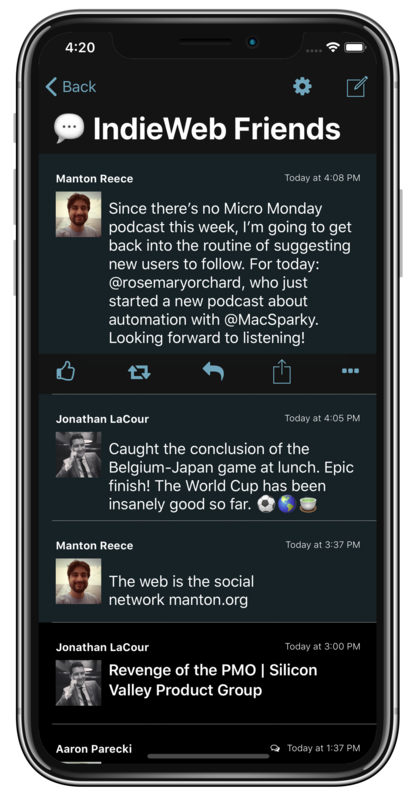 I would say the four primary changes are: Theme Support (Yes, Indigenous has embraced the Dark Side), Full Post view, Timeline Response Bar, and an Onboarding Screens for New Users. Themes are almost always appreciated in iOS apps, but ESPECIALLY in reading apps. I’ve started off by building support in Indigenous for a Light theme and a Dark Theme (called Cardinal and Zombie, respectively). The base color of the light theme is white and the base color of the dark theme is black. The text color should invert and the tint color throughout the app should change from the light red to teal color. There are some bugs and It’s just first steps as far as these themes go. I want to add support for changing the theme based on screen brightness and find other ways to optimize. Eventually maybe we can even add some new themes… maybe some Easter egg themes even! One thing I’ve always loved about using Tweetbot has been the ability to just tap on a tweet and instantly respond to it. I wanted to make sure Indigenous had that ease of use. So I’ve added a Timeline Response Bar. When you tap on a post in the Timeline view, it shows a response bar. 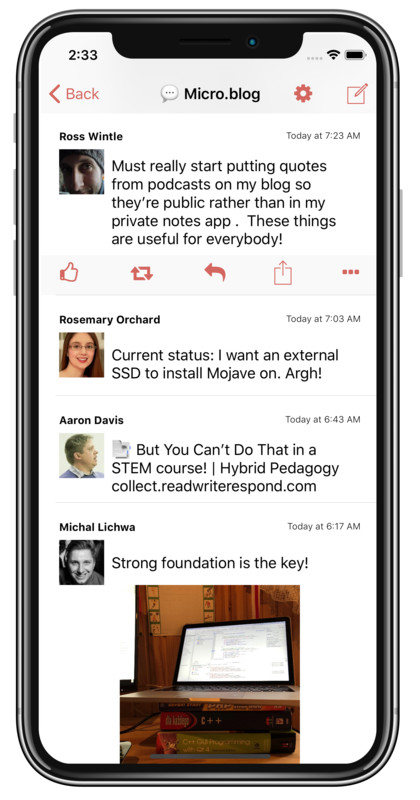 Currently the response bar presents 5 options: Like, Repost, Reply, Share, and More. Like and Repost instantly send a Micropub request with those actions taken on the URL of the post in the Timeline. Reply opens a reply window, so you can type out a reply to the post. 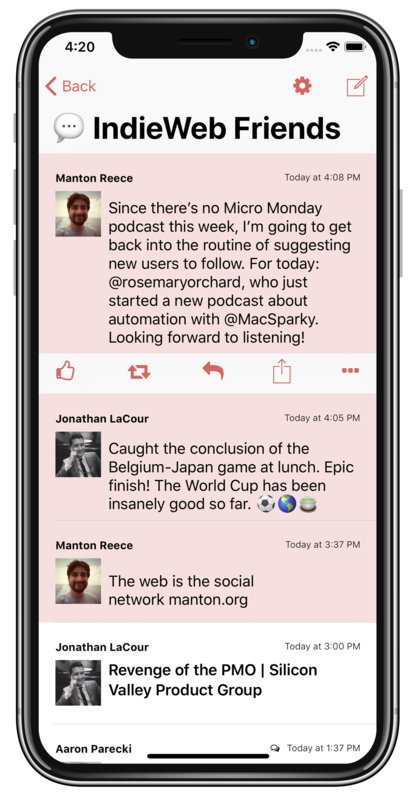 Share opens the URL of the Timeline post in the native iOS share sheet so you can do anything you feel like you want to do with the post. (Until I officially build in IndiePaper support, I use the Share action to send posts I want to read later to my Saved channel using the IndiePaper Workflow. More lets you do other, less common actions. Right now this makes available the ability to: “Mark post as read/unread”, “Mark posts below as read” and “delete post”. Marking post as read/unread is a toggle that changes the read status of the post. Mark posts below as read, marks all the posts that come before that on as read, which is helpful when trying to quickly mark a bunch of stuff read. Finally, delete post is great for when you get a post in your timeline that you just never want to see again. This was something I have been wanting to get into Indigenous for awhile. When you swipe left on a Timeline post, instead of opening the post’s original URL in an in-app browser, it actually loads the post into a Full Post View, allowing you to read an entire article with HTML displays and everything. I’ve been really enjoying this, especially with IndiePaper . My goal is for Indigenous to one day completely replace my use of Instapaper and with the public release of Indigenous I am getting pretty close. When you scroll in Full Post View, the top and bottom bars disappear, allowing you to just focus on reading the article. Speaking of the bottom bar, the bottom bar allows you to do everything that the Timeline Response Bar does, with the addition of one thing: opening the post in Safari. Sometimes you might get to the Full Post View and realize you just really need to visit the page that this post is from, and that’s what the Safari icon does! With Micropub and Microsub being a relatively new protocol and not many people outside the IndieWeb community having support for these technologies, I knew I needed to find a bit more of a user friendly way to introduce these concepts. 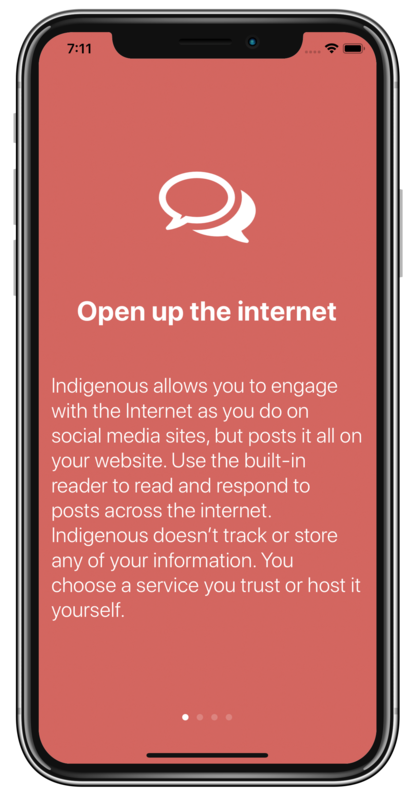 My solution was a couple on-boarding screens with links to help pages on the Indigenous for iOS website. 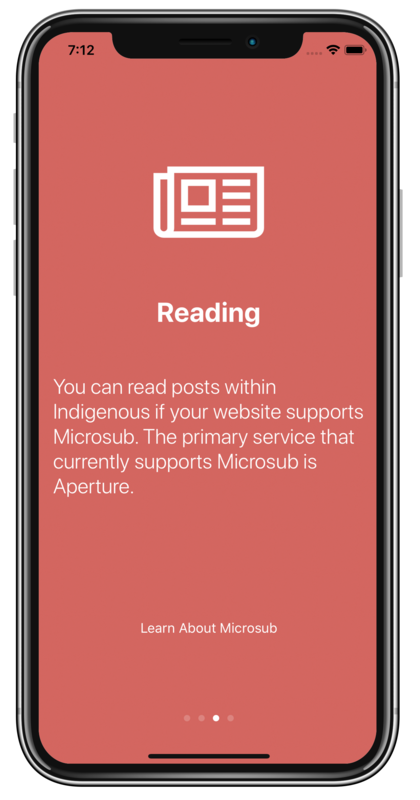 The on-boarding screens essentially introduce the concept of Indigenous, the use of Micropub, the use of Microsub and then has the user login via IndieAuth. 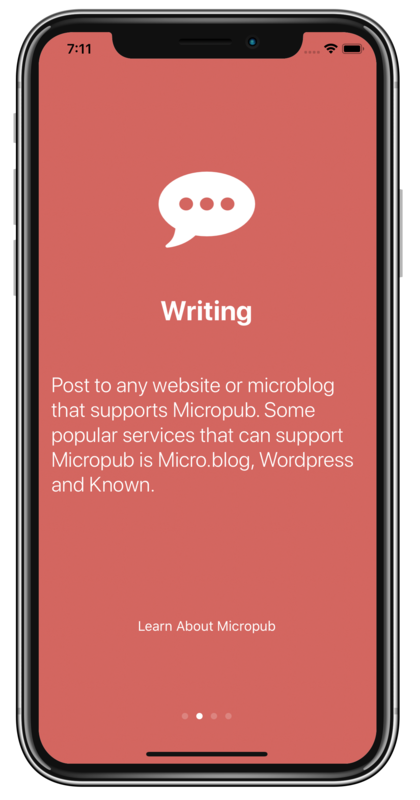 The Writing page links to the Micropub Help Page which highlights the most popular services and software that support Micropub as well as some links for more technically inclined folks. The Reading page links to the Microsub Help Page which explains what Microsub is and highlights what services and software support Microsub (spoiler: currently, Only Aperture, although I’ll continue to expand this page as new Microsub services and software come available). The Login page links to the IndieAuth Help Page which explains what IndieAuth is and highlights the most popular services and software that support IndieAuth as well as some links for more technically inclined folks. The goal with all of these help pages is to make it as easy as possible to use popular software and services that people know of in order to get up and running as easily as possible. So I link to help pages or tutorials when available and plugins when needed. If you want all the nitty gritty on the features and bug fixes in this release, it’s all listed below for you. 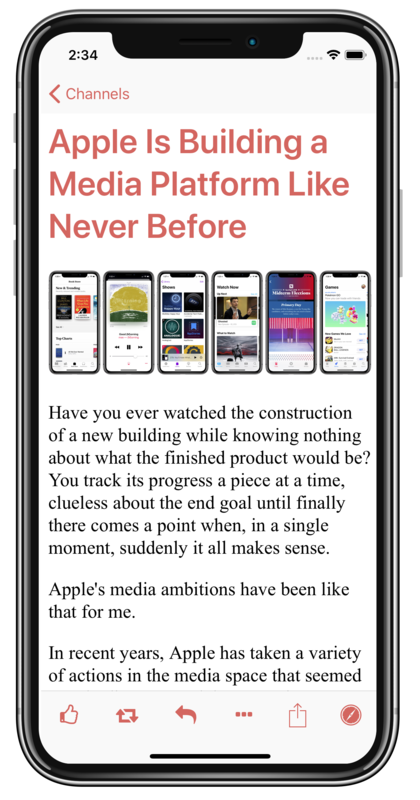 Added Full Post view that supports showing an entire article in an immersive reading mode along with a response bar at the bottom. Added a response bar to the Timeline when a post is tapped. 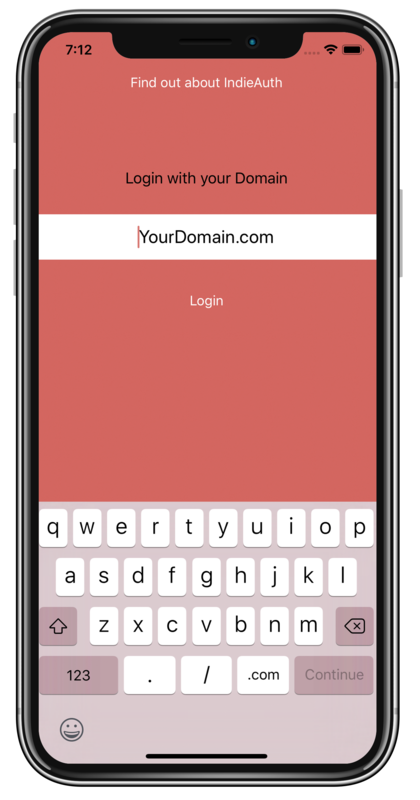 New On-boarding Screens when the app is launched without any users being logged in. Added a summary fallback attribute to "like" and "bookmark" Micropub posts that are published to servers that don't support like or bookmark posts. Added simple summary text to the Timeline to improve when a post is a "like" or a "bookmark" post. Added a Microsub help screen in place of the Channels list if the user has logged in with Micropub only. Wordpress Emoji images are no longer treated as "Post Photos"